Best to grow one’s own herbs because we’ll ensure that they are pesticide-free for our good health. 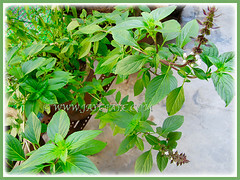 We have been planting Thai Basil or Anise Basil for several years in a pot at our backyard where most of our herbs such as the Mentha spicata, Pandanus amaryllifolius and Murrays koenigii or Curry Leaf are located. 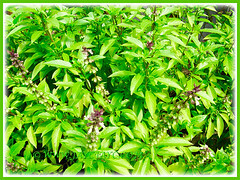 It can be easily planted… in 2011, we bought a bunch of fresh and healthy-looking Thai Basil from the grocery store. Then fill our pot with garden soil and thrust them about 2 cm deep into the soil and water them regularly for success. They flourished beautifully. We just love them as they are distinctly flavourful when added to spaghetti or omelette. Definitely, we can’t do without them! 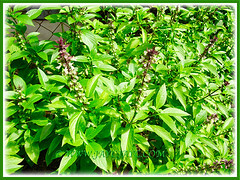 Common Name: Thai Basil, Anise Basil, Licorice/Cinnamon Basil. Etymology: The genus Ocimum, a Greek word, meaning to be fragrant. The species name, basilicum comes from the Greek word basileus, which means kingly or royal plant as Basil is often referred to as the king of herbs. Origin: Native to Southeast Asia, but cultivated worldwide. Plant type: An aromatic spreading perennial herb in warm tropical regions and an annual in cold regions. Features: Ocimum basilicum is a one of the most important commercial species belonging to the genus Ocimum that consists of about 68 accepted species and numerous hybrids and cultivars.A fast growing perennial herb that reaches a height of 45 cm. The leaves are medium green and oval in shape with pointed ends and serrated margins. The leaves are arranged in pairs along the purplish branched stems and whorled at the top. The Thai Basil plant produces small white and deep purple tubular flowers in slender spikes and clustered at the tip of a green or purple stems and tapering at the apex. The central spike may be flanked by one or more flowering stems. 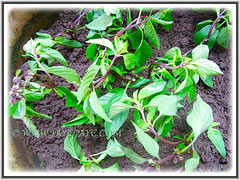 Culture (Care): Ocimum basilicum or Thai Basil grows easily with least maintenance. Light: Best in full sun or semi-shade. If provided with less sunlight, the plants tend to get leggy. Moisture: Moderate water needs. Water regularly for optimum growth. Soil: Not particular but best to grow in organic-enriched, loamy and well-draining soils. Others: Do prune off the growing tips just above a pair of lower leaves to encourage compact growth and branching, as well as to prolong harvest. Cut off the flower spikes too as they deplete the plant’s energy, resulting in fewer leaves. Feed it once monthly with a balanced liquid fertiliser for foliage plants. Generally free from serious garden pests and diseases. However, do watch out for infestation of spider mites and mealy bugs. For subtropical and temperate regions: Hardiness: USDA Zone 10. 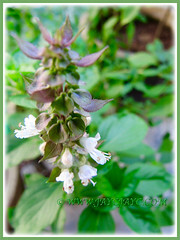 Ocimum basilicum or Thai Basil is hardy only in very warm climates where there is no frost. It dislike cold weather. You can sow the seeds outdoors when day and night temperatures reach about 12.8°C to 15.6°C. Schedule to sow your seeds when the first sign of frost is past in late spring or early summer. Propagation: Best to propagate by sowing seeds or by stem cuttings. 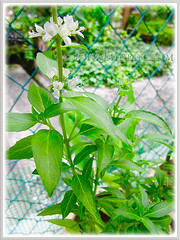 Usage: Ocimum basilicum or Thai Basil has many uses. It is an indispensable herb with its unique flavour and aroma that is used extensively in cuisines at home and restaurants to flavour food, especially in Southeast Asia. Most ideal for container planting in pots and raised planters, as well as in the ground. Also, the usage of Thai Basil is known in traditional medicine whereby herbalists claim that it helps to ease flatulence and abdominal pains if taken as an infusion.